The things we do using miles/points in this hobby allows us experiences like the ones I list below. You can support TBB by applying for CREDIT CARDS, shopping with our Amazon affiliate link and clicking/forwarding any of our Referral Links. Or click on the Amazon Banner on the right, thank YOU! If you are a new reader please read how TBB managed to take a trip to Hong Kong using 227,750 miles & points and $0 cash out of pocket! By the time you are reading this I should be back in US soil and probably in catch up mode at the New York City La Guardia’s American Express Centurion Lounge! 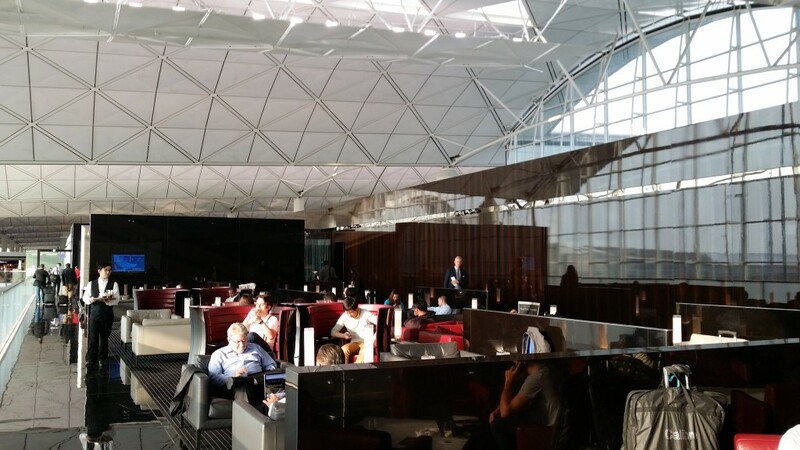 I am preparing this post at The Wing, Cathay Pacific’s First Class Lounge in Hong Kong while waiting to board my flight to JFK in F…This was a pure George trip to burn some miles and take advantage of United’s pre mega devaluation awards. I have been reading all these bloggers for years showing off it was time to experience this myself for a change. I would rather have my family with me but I think once a year doing a trip alone is good. This post is NOT about the destination. As Frequent Miler says why take a trip in style? Simply because…we can! 2. 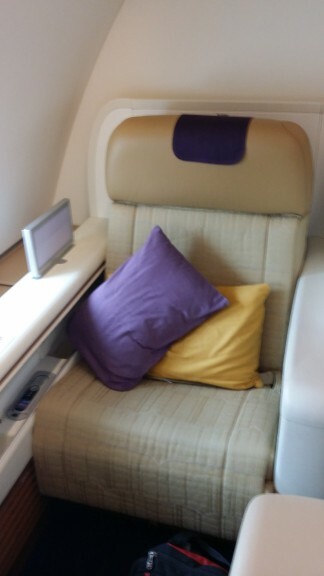 Flew first class on Thai Airways. From Paris to Bangkok. Loved it! 3. 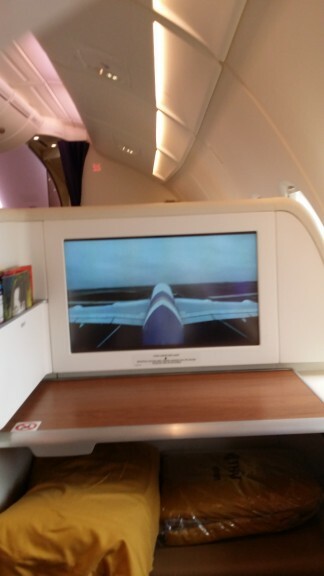 Flew finally the Airbus A380 on this Thai Airways flight. Yes it is an awesome plane. And the camera on it is awesome too! 5. Got the ground treatment of Thai Airways F passengers in Bangkok. It was fun being driven by a buggy and sure beat walking after an 11 hour flight! 6. Got the famous one hour massage in the Thai Airways Royal First Lounge! Slipping into a tiny piece of cloth after told it was going to be served as “underwear” was a bit of a shock but got over it and managed to really enjoy it! 7. 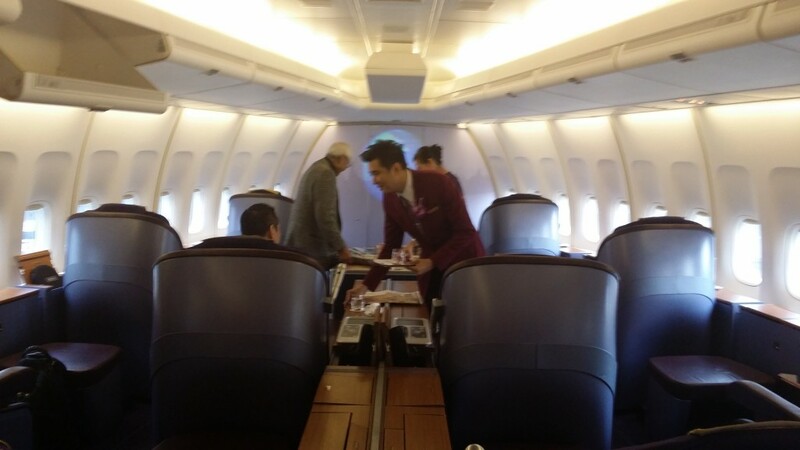 Flew First Class in an intra- Asia flight on Thai Airways from Bangkok to Hong Kong. It was on a 747-400 and the First Class configuration was incredibly spacious. Very unique! 8. 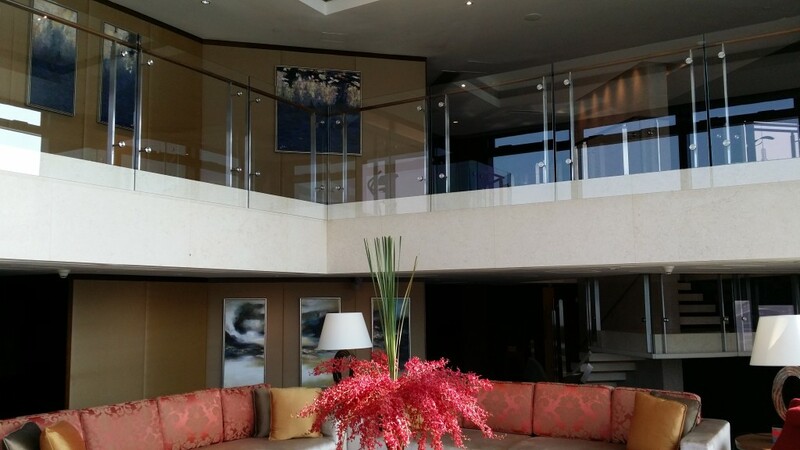 I was given a private tour of the Presidential Suite of the Intercontinental Hong Kong hotel! Blown away. Totally LOVED my stay here! 9. 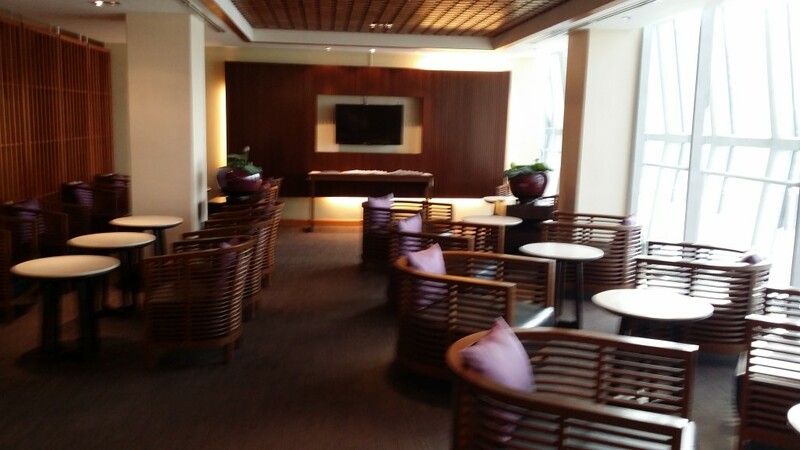 Visited the famous THE Wing, Cathay Pacific’s First Class lounge in Hong Kong Airport. The food here is incredible! 10. 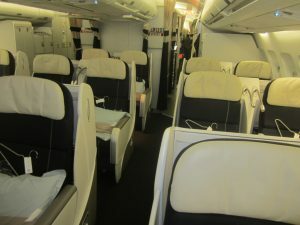 Flew Cathay Pacific for the first time and in First Class from Hong Kong to New York City’s JFK. 15 hours of bliss. My best flight ever. The food was amazing! I am glad I got to experience this once. But after you experience it once is it worth the splurge in miles? Not imho. 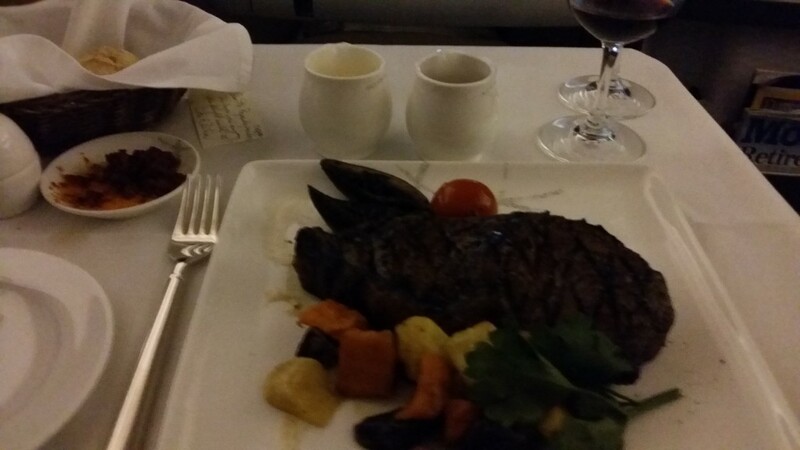 So go ahead splurge once before American Airlines does a United like move, hurryyyyy! 11. Hey, like the plastic pushing bloggers who never stop at just ten credit cards why should I huh? 🙂 I never ordered a $40 hamburger until this trip. 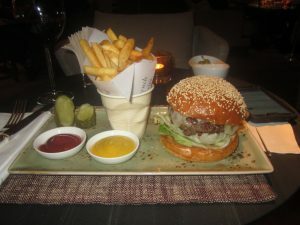 This baby was eaten at the lobby bar in the Intercontinental Hong Kong lobby after a full day of walking around and having no energy to go out and as I was drinking a glass of red wine (free drink voucher at check in) I tried to find something reasonably priced and this was it! 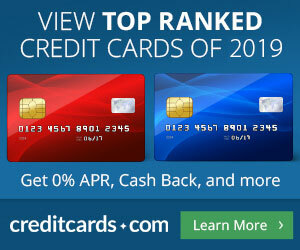 Hey, this is why you earn Barclaycard Arrival points and this is how I will pay for it! Needless to say this WAS indeed the best hamburger I ever had! First! Looks like you had a fun trip. 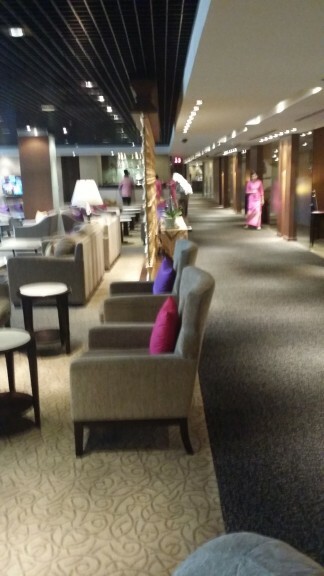 Not over yet…Heading to the Amex Centurion lounge in LGA! Visited the one in Moorea while staying at the Sheraton (now Hilton) next door. It looked very nice indeed. Been to the one in Papeete, Moorea and to both in Bora Bora. Definitely a great use of free room cert or points! Great idea in Hong Kong as well. I am keen to go to Macau and had to cancel a trip there recently for a family obligation. So, I will be heading that way in the near future. How is Hong Kong right now? There is so much media attention to the protests, but I know when I was in Taipei there were tons of protests and it was not a huge issue. Did it impact your trip at all? How do you get your family to agree with going solo? Yeah does not happen very often. Both times I got away this year alone (one to Brazil for the World Cup) were less than a week trips…this helps! Great top 10! 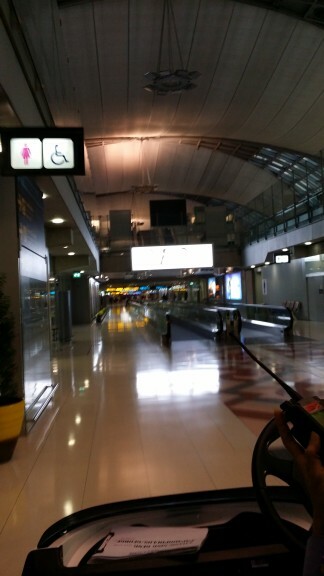 (11) Glad to hear you enjoyed your trip. Could you do a post about Hong Kong and all food that you ate, specific locations — I am there for 3 days (miles burning trip) in February, so I’d love to visit some of these spots. Apologies if you already wrote it in a previous blog post, just point me into that direction. Email me. I am no foodie. Tim Ho Wan…u need to bear the wait to taste them BBQ buns. The ridiculous $40 burger at the lobby bar at the Intercontinental is mouth watering. Use Barclaycard Arrival to pay for it. The Chinese restaurant at the IC is overhyped, avoid it. Plenty of food places around. I think I enjoyed going into a couple of dives and ordering what I saw and paying $4 or so and eating with the locals. I think that’s pretty much it…Like I said, I am no foodie. And this was really short trip to do more research. WELCOME BACK. WE SOLD MANY CARDS DURING YOUR ABSENCE. Expected nothing less, you are THE machine! He’s just happy he moved himself up to the blogs I like list. Not sure when, or if, I can justify $40 for a burger. It is making me hungry though. Can I like this post? Where is the thumbs up button? Intern has been working on that button for ever! Welcome back. Great reading your short trip report. Hope a detailed one follows. I saw your link on Twitter. I missed this the first time around. I was away on a business trip.